Friday’s weather will be cloudy throughout most of South Korea, but torrential rain will continue to hit the Chungcheong and Jeolla provinces, according to the Korean Meteorological Administration. Parts of the Chungcheong and Jeolla provinces will receive 50 to 100 millimeters of rain Friday, while the Gyeongsang provinces, Jeju Island and the southern parts of Gyeonggi Province will have 30 to 100 mm. About 5 to 40 mm are expected to fall in Seoul, Gangwon Province and the northern parts of Gyeonggi Province. 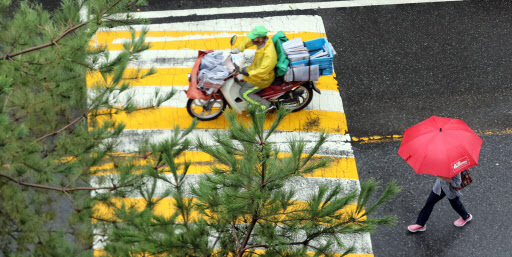 The rain will start to die down Friday afternoon in the central region of Korea, but the downpour will continue until Saturday night in the southern regions, the weather agency said. Only Jeju Island will see rain Sunday, but on Monday the rainy weather will resume nationwide. Daytime temperatures will hover between 26 and 33 degrees Celsius. The daytime high will be 29 C for Seoul, 27 C for Incheon, 29 C for Suwon, 28 C for Gangneung, 26 C for Daejeon, 29 C for Gwangju, 29 C for Daegu, 29 C for Busan and 33 C for Jeju Island.